This chrome glass rack features a accent cool neutral tones. Each rack is ceiling mounted with an entry position and a stopping opposite end to prevent glasses from falling out. These overhead hangers are just as functional as they are attractive, as they keep dust off of glasses and provide extra storage space for busy bars. 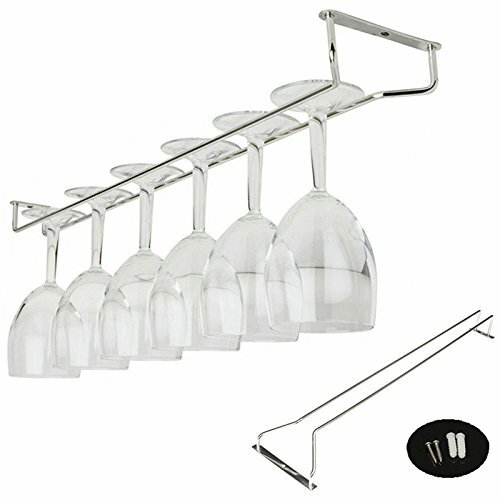 The rack is designed to fit any stemmed glass, included martini glasses, wine glasses and cocktail glasses. Available in chrome finish and measures 21-inch in length. If you have any questions about this product by Liangxiang, contact us by completing and submitting the form below. If you are looking for a specif part number, please include it with your message.